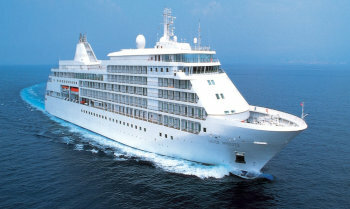 View all Silver Whisper cruises or view more options for Silversea cruises. With complimentary cocktails and engaging conversation, live music and a dance floor, The Bar on board this luxury cruise ship welcomes guests to mix and mingle while they cruise to their destination. A full range of salon services including hairstyling, manicures and pedicures, is available on board this luxury cruise ship for both men and women. Appointments for these chargeable services may be made on board the ship, or in advance via My Silversea. Maintain the look of prestige travel while you cruise. Exceptional shopping experiences do not end in the cosmopolitan cities we visit. Silversea’s striking new boutiques aboard the cruise, reimagined and redesigned by famed Italian architect Tiziano Vudafieri and his team at Vudafieri & Saverino Studio, are stunning modern design spaces befitting the finest creations from legendary designers including Buccellati, Damiani, Le Vian, Tag Heuer, Bulgari, Gucci, Paul & Shark, Sisley, Swarovski and more. A new partnership with the LVMH Group company Starboard offers in our boutiques a carefully curated selection of cutting edge fashions, jewelry, accessories, fine perfumes and cosmetics from iconic brands renowned for blending tradition, innovation and exceptional quality. Should your group require a conference or meeting space, Silversea is pleased to provide a tailor-made experience. Audio-visual equipment is available and complimentary on our top cruise line. The Library on board this luxury cruise ship has an extensive selection of hardcover books, magazines, reference materials and newspapers, as well as audio listening stations. Movies are also available and can be viewed on your in-suite entertainment centre while you cruise. The Fitness Centre on board this luxury cruise ship is equipped with free weights, weight machines, state-of-the-art treadmills, elliptical trainers and recumbent and upright bicycles. Classes in aerobics, yoga, Pilates and circuit training are led by the onboard fitness trainer and are always complimentary on Silversea’s best cruise line. Personal training, body composition analysis and specialty classes are available at an additional charge. The Panorama Lounge is specially designed by Silversea to provide an uninterrupted view of the day’s destination from the comfort of the luxury cruise ship’s interior. This is an ideal place to unwind, enjoy afternoon tea, listen to the pianist and watch the setting sun while you cruise. The drinks are complimentary, the music live and inviting. Enjoy dancing to a range of musical styles for every taste from standards to the latest club mixes. Chaise lounges arranged in the sun or shade. Bubbling whirlpools. The pool water refreshing in warmer climates, heated for cooler weather. The attentive staff of the Silver Whisper cruise ship at the ready with an oversized towel as you emerge from the pool, with your favourite beverage at just the right moment. The luxury cruise ship of your dreams. Relax your body and mind in this luxury cruise ship’s soothing sanctuary. Indulge in a wide range of invigorating therapies at the spa, including facials, body wraps and massages. Appointments for these services may be made on board the ship, or in advance via My Silversea. Men’s and women’s saunas and steam rooms are perfect for relaxing before your luxury spa treatment or after your workout. The eponymous lounge carries its name well. Set on the highest level at the very top of the ship, this is a quiet space for reading and reflection while being dazzled by the undulating seascapes that are constituent to life on board. Borrow a book from the in-house library, read the papers or just embrace the tranquility of being at sea. Every seat in this luxury cruise ship’s multi-tiered venue enjoys a clear view to the stage. Applaud a broad spectrum of entertainment brought to the Silver Whisper – from full-scale production shows and classical soloists, to cultural entertainment and feature films. Throughout your voyage, the Show Lounge also presents port talks, enrichment lectures and a variety of special events throughout the cruise. Sparkling with silver, crystal and candlelight, this luxury cruise ship’s main dining room serves contemporary, international cuisine with sophisticated elegance and impeccable service. Menus feature regional specialities unique to the voyage destination, for example, Roasted Chilean Sea Bass while cruising the Chilean fjords and Indian Chicken Korma en route to Mumbai. During days cruising on the Silver Whisper, choose something from La Collection du Monde, a series of signature dishes created exclusively for Silversea by the Grands Chefs Relais & Chateaux. The only Wine Restaurant by Relais & Châteaux at sea can be found aboard the luxury cruise ships of Silversea. Indulge in an evening where fine wines are complemented by a set tasting menu of regionally inspired dishes in an intimate, elegant setting. An extraordinary six-course experience celebrating the world’s most distinguished wine regions, all while you cruise. Per guest reservation fee of US$40. Please visit My Silversea to make your reservations. Casual and convenient. At the Pool Bar, cocktails are served with soft ocean breezes. Poolside menu options feature healthy CruiseLite selections and light fare for breakfast and lunch including grilled meats and fresh-from-the-oven pizza. On board this luxury cruise ship a divine selection of Italy’s best cuisine is served a la carte in La Terrazza. Authentic recipes and the freshest ingredients come together with flair and passion aboard this luxury cruise – a flavourful expression of Silversea’s distinctive Italian heritage. La Terrazza is open for casual, buffet-style breakfast and lunch with indoor or al fresco dining on the outdoor terrace. During the evening, La Terrazza transforms into an à la carte traditional Italian restaurant. Open-seating for breakfast and lunch.